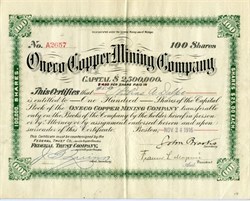 Beautiful RARE stock certificate from the Oneco Copper Mining Company issued in 1916. This historic document was printed by the Boston Bank Nnote Company and has an ornate border around it with the company' name on top center. This item has the signatures of the Company’s President, John Brooks and Secretary. According to Lee De Good's Michingan Mining Book, there are lees than 10 of these certificates known to exist. According to B. S. Butler (personal communication) this amygdaloid is probably near horizon of Isle Royale amygdaloid. Belongs in Central Mine group. The mineralized part is the Oneco lode. Named for Occurrence in Oneco mine, Houghton Co.
Oneco flow. Includes Oneco amygdaloid and underlying trap. The Oneco Copper Mining Company was organized under the laws of Michigan with a capitalization of 100.000 shares, in 1899. W. F. Fitzgerald is president, and S. S. Millett secretary and treasurer. The general offices are in Boston. The number of shareholders on Dec. 31, 1899, was 172. This property was formerly known as the Hungarian, the name being changed a few years ago to Fitzgerald, under which title no work was done on the mineral tract. The Hungarian was one of the oldest mining locations on the outskirts of the Portage Lake district, but no great amount of work was ever done there. The Oneco, as at present constituted, consists of 800 acres of land, all on the mineral belt, lying in Sections 2, 3 and 10, Town 55 North, Range 33 West. It has the Dover and Torch Lake mineral properties and lands of St. Mary's Canal Mineral Land Company to the north; Canal lands and a tract owned by the Tamarack company on the east; Tamarack and Canal lands on the south, and the Arcadian, Union Land & Copper and Canal lands on the west. The tract is very irregular in outline, there being 160 acres in the northeast corner which join diagonally on the main tract of 640 acres. The greatest length on the strike of the formation is l%o miles. The 160 acres in the northeast lie half a mile west of the Eastern Sandstone and the main tract has its eastern boundary three-quarters of a mile west of the sandstone. An exploring shaft was sunk on the Hungarian lands to a depth of less than 100 feet in 1862, and the showing then made created some excitement locally, but for some reason work was stopped. A little exploring was done on the property in 1890 by Capt. W. A. Dunn, and some additional work was performed in 1898 under the direction of Mr, Fitzgerald, before the formation of the Oneco company. A rich outcrop of conglomerate was found, but this proved to be a drift boulder of large size, and not rock in place. The first actual mining work was done by the Oneco company on June 26, 1899, when the first sod was turned for the permanent shaft. The work was begun under direction of Capt. Joseph Hocking, who remains in charge of the property, as superintendent and mining captain. The shaft is of two compartments, well timbered through the overburden. The shaft is down more than 500 feet, at this writing Nov. 8,1900, and a little drifting has been done on four levels, probably about 500 feet in all. The lode is of fair width and carries copper in sufficient amount to give promise of opening a profitable mine, if worked on a large scale. One of the interesting things met with in the descent of the shaft was a narrow fissure carrying a large amount of barrel copper. A little drifting was done on this fissure, and it will be given further attention in the future, but the present policy of the company is to concentrate energies on sinking, with a little drifting at each level as opened. The fissure is of geological interest also, being one of the few productive cross-veins found in the Portage Lake district. The lode on which the shaft is sinking has generally been considered the Isle Royale or Grand Portage, but Capt. Hocking believes it to be the Kearsarge amygdaloid. The shaft is apparently in line with the northern strike of the twin lodes named, and is certainly much east of the Kearsarge lode produced, but it is possible that though faulting or twisting the Kearsarge has been thrown to the eastward on the Oneco property; but in the light of present evidence it seems scarcely probable that the Oneco shaft is located on the Kearsarge lode. The affairs of the company are being managed with exceeding prudence by Capt. Hocking, who is probably getting as many feet of opening for the money spent as is being secured at any new mine in the district. At present only twelve miners are employed, but these are picked men and are sinking the shaft quite rapidly. The surface force is even smaller, so that less than twenty men all told are now on the Oneco payroll. The surface improvements consist of one building for engine, boilers and compressor; blacksmith shop; warehouse; mine office; powder house; office; shafthouse, and eight dwellings on Dover Creek. The compressor is capable of furnishing air for six drills, twice the number in use, and the hoist is good for the depth of a quarter-mile. footwall, the inclination was changed to 33 degrees. It is possible that the permanent angle may prove a trifle sharper than 33, owing to the rolling of the lode in its dip. In addition to the amygdaloid now beingopened, other cuperiferous beds are supposed to cross the Oneco lands. Two additional copperbearing amygdaloids have been located, one to the east and one to the west of the lode now being opened. At the annual meeting of the company, held in March, 1900, the treasurer's report for the year ending Dec. 31, 1899, showed receipts of $210,000 from the sale of 70,000 shares of the capital stock of the company, also $318 received as interest. The price paid for the lands was $150,000, leaving $60,318 available for exploratory and development purposes, of which amount $34,843 was expended in 1899, leaving an available balance of $25,475 in cash and supplies at the mine.